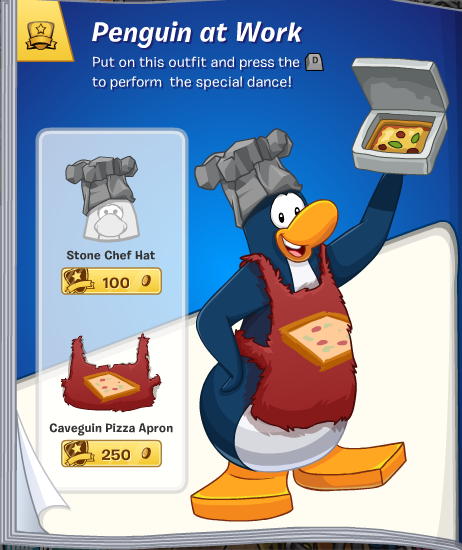 Club Penguin has just released a new style catalog for January of 2014. Every month Club Penguin releases a new catalog full of exciting new clothes. Usually, each catalog has a certain theme such as this catalog. The theme for this catalog is prehistoric times since the Prehistoric Party will arrive to Club Penguin the island soon! Let's get into it. Related: Get free Club Penguin codes for clothes and coins! First off, we have two new backgrounds that you can add to your penguins inventory. These backgrounds would look great if your penguin is wearing a 'pre-historic' themed outfit. Next, we have some pretty new outfits for the girl penguins. There is only one hidden item on this page. Click on the Stone Necklace for the hidden item. Now, we have some exceptional outfits for both girl and boy penguins. I really like the Cavegeek outfit for my penguin but i'm not liking the Top Knot hair style so much. The hidden item on this page will be found if you click the footprint next to the Cavegeek glasses. We now have a outfit that, I guess, can be used by both a girl and boy penguin. I'm pretty sure one of these items were released last year but I am not sure. The hidden item on this page can be found by clicking the penguin on the lefts head. If you don't really want to dress like a prehistoric penguin then this page is for you! 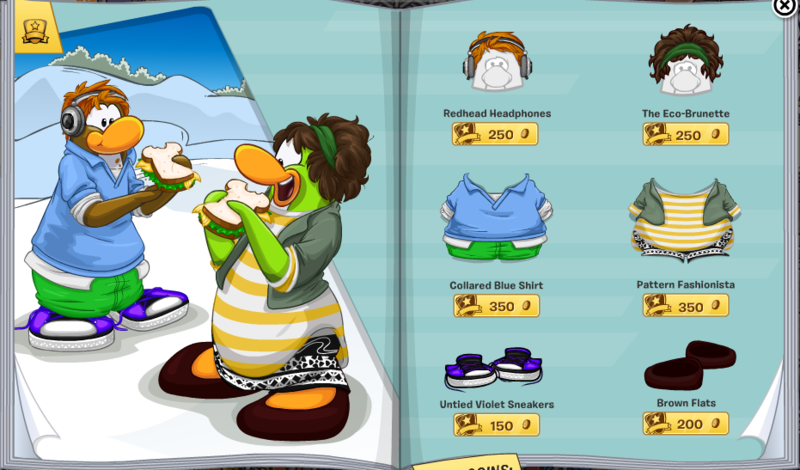 On this page we find outfits for both boy and girl penguins. There is no hidden item on this page. On this page there are mostly head and face items for your penguin. There is only one hidden item on this page. 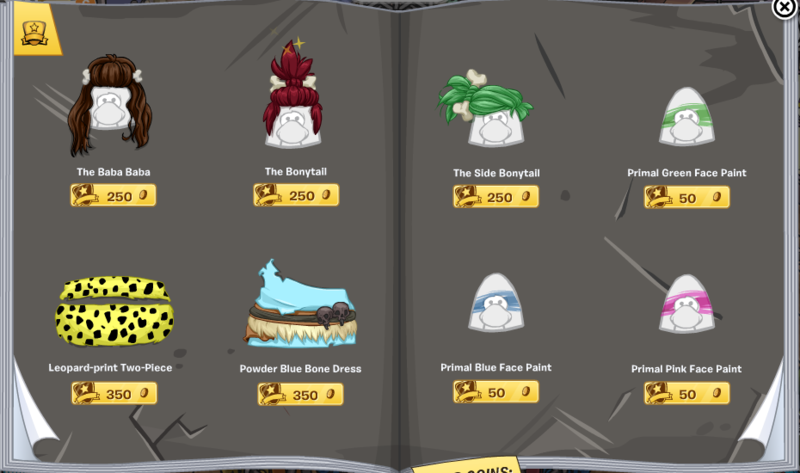 You can discover that secret item by clicking the top of The Bonytail item (the dark red hair item). Now you can wear prehistoric outfits and be fancy at the same time! You can find formal clothes on this page such as the Glam Glam Gown or the Stone Bow Tie. There is no hidden item on this page. And last but not least we have the Penguin At Work outfit. Club Penguin releases one every month. This outfit is special because if you wear it and click the letter 'D' on your keyboard your penguin will start doing something cool! Try it out! There are no secret items on this page.